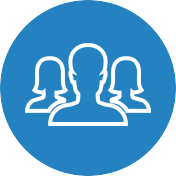 At Manhattan Orthopedic Care, we treat our patients as if they were our family members. We strongly believe that building a family-like relationship offers the supportive environment that patients need for a smooth and stress-free recovery. 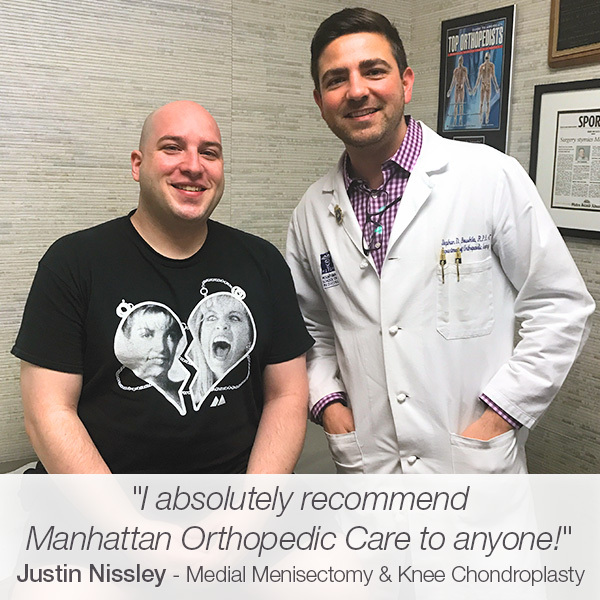 Justin Nissley was immediately impressed with the professionalism and the honest communication that he was presented with during his first visit at Manhattan Orthopedic Care. He had an appointment with Dr. Armin Tehrany because of an agonizing pain in his knee. The extensive examination revealed that Justin had a torn medial meniscus and chronic re-tear in his right ACL. 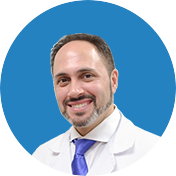 As a compassionate medical professional, Dr. Tehrany never misses the opportunity to thoroughly educate his patients on their orthopedic condition and the available treatment options. 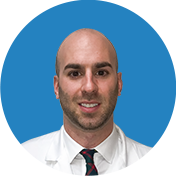 Led by his vast experience in knee treatment, Dr. Tehrany knew that Justin’s knee had suffered more than what the scans revealed, so he recommended proceeding with a diagnostic knee arthroscopy. 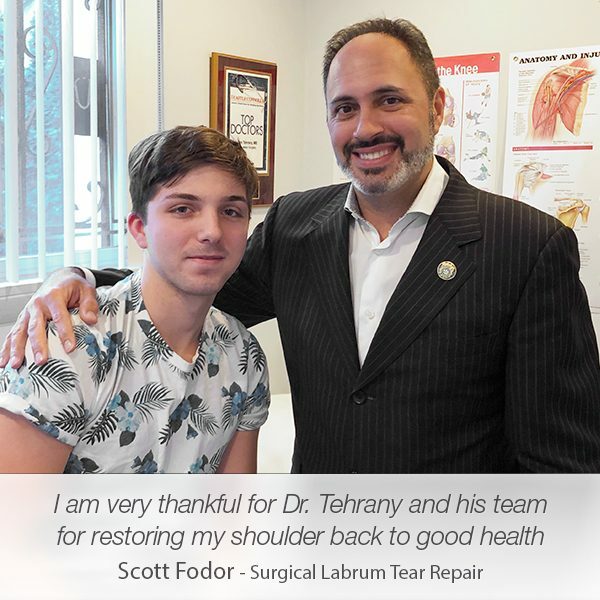 Prior to scheduling the knee surgery, Dr. Tehrany had a quiet conversation with Justin where he exhaustively explained the steps and the details of the knee surgery. 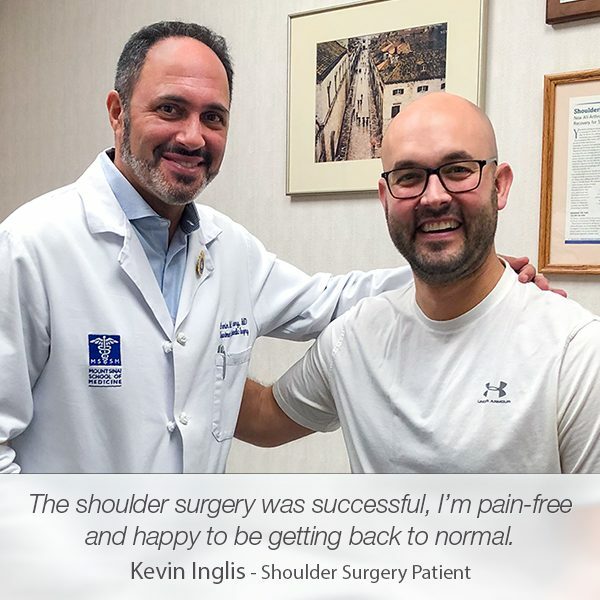 The conversation helped Justin to feel comfortable with the decision to undergo the knee surgery, and more importantly, he felt confident that Dr. Tehrany was the right doctor to help him enjoy pain-free life again. 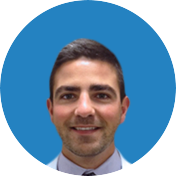 Because of the candid communication and genuine care, Justin felt Dr. Tehrany was a greatly reliable knee doctor to improve his knee health. 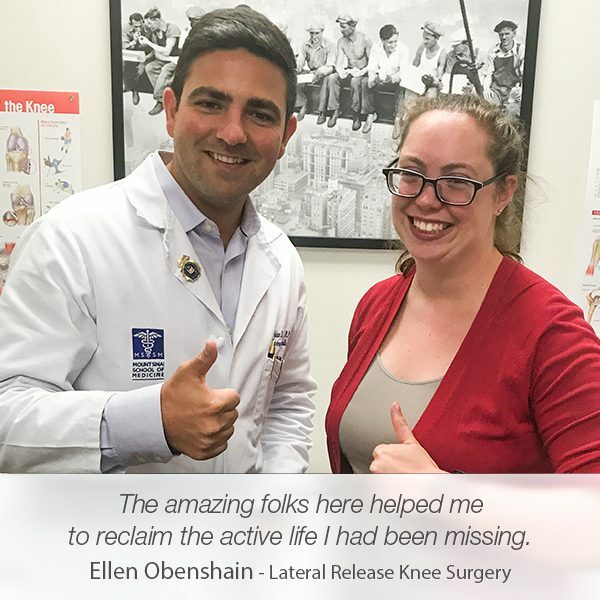 During the knee arthroscopy, Dr. Tehrany discovered chondromalacia of patella and a medial compartment that also required an immediate attention. At the beginning of the surgery, Dr. Tehrany performed partial medial meniscectomy and chondroplasty, and he also smoothed the remaining meniscus to a stable rim. He, then, continued with the patellar chondroplasty which was successfully completed. At the end, Dr. Tehrany addressed the re-tear of the ACL. The knee surgery was followed by a stable recovery that helped Justin regain his knee strength in no time. 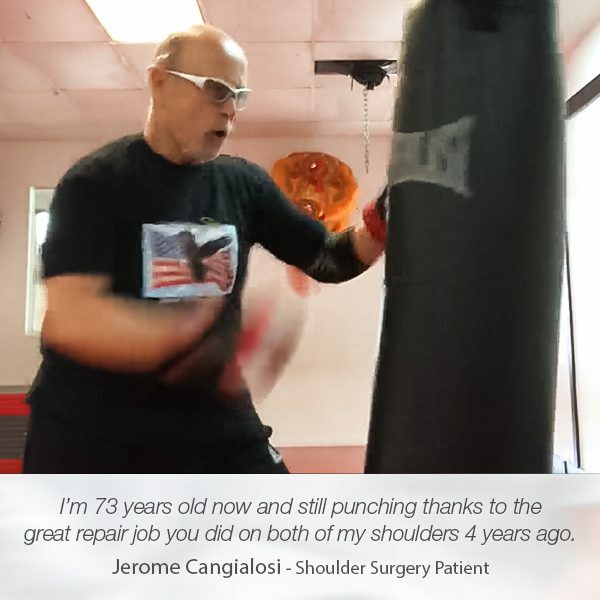 Thrilled with the surgery outcome, Justine was happy to share his positive experience with Dr. Tehrany and the entire team at Manhattan Orthopedic Care with a candid Google review.